Road usage charging (RUC) is an alternative funding mechanism to support road maintenance and construction. Road usage charging (RUC), sometimes referred to as vehicle miles traveled (VMT) fees or mileage-based user fees (MBUF), is a policy whereby motorists pay for use of the roadway network based on distance traveled. With growing interest in sustainable and equitable methods of paying for maintenance and operations of transport infrastructure in the face of declining fuel tax revenues, worldwide interest in road usage charging programs has grown significantly over the past decade. 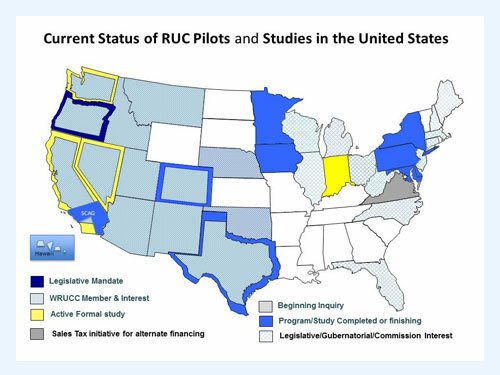 Like tolling, RUC is a direct user fee that supports the “user pays” principle of transportation funding as well as the notion of managing road networks as utilities. Whereas toll systems are generally deployed on one or several facilities, such as an expressway corridor, bridge, or tunnel, road usage charges apply to all roads in a defined jurisdiction or geography at all times. RUC can be implemented using a wide range of approaches, from paper licenses and odometer readings to automated technologies, such as in-vehicle devices and telematics systems built in to vehicles. GPS and other location technologies are not required to measure or report distance traveled. Consumers are purchasing and driving more fuel-efficient vehicles, including electric vehicles, thus paying less in fuel tax per mile driven than ever before, and in some cases paying no fuel tax at all. Although fuel prices have increased dramatically in the past decade, U.S. Federal fuel tax revenues and most state fuel tax revenues have not come close to keeping pace. Most fuel taxes consist of a fixed number of cents per gallon and are not tied to inflation. Documentation of Minnesota pilot test (2012-2013): Operations Report and Evaluation Report.